It’s not advised to drink while you are out fishing, but there is no reason why your catch can’t have a bit of wine. If you miss out on this one, it will forever be the one that got away. • Place wide frying pan on high heat. Add 2 cups white wine and bring to boil, then add two whole, gutted trout into pan, approximately 1 pound each, and reduce to low heat to simmer. Slice 2 onions and place over top of the fish. Season liberally with salt, about 2 teaspoons. Cover pan and poach gently on low heat for approximately 8-10 minutes until fish is cooked. Remove from heat and remove lid. • For asparagus: Place large pot of salted water onto boil. Get another large bowl filled with ice water. Trim 1 pound asparagus, and add to boiling water. Allow to cook for 30 seconds to 1 minute depending on thickness of asparagus. Remove asparagus from boiling water and plunge immediately into ice water to stop the cooking and retain the colour. Now place on paper towels to dry. • Make dressing with 1 tablespoon lemon juice, 3 tablespoon olive oil, teaspoon sugar and salt and pepper. • To assemble salad, slice up 1 pound boiled potatoes, and mix with ¼ cup chopped fresh herbs (parsley, mint, chives) and dressing. 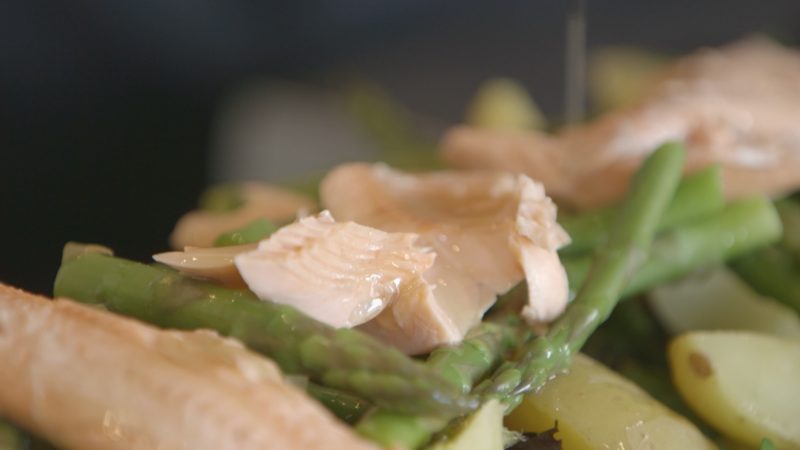 Lay asparagus over top, and top with flaked poached trout.